Now we have Chess Ultra for the PS4. Does it manage to capture the thrill of this classic game, or would you better off just playing the game in person? It’s time to find out! Chess Ultra doesn’t have a story like many games, but that’s to be expected. Chess isn’t about what’s happening on the board, it’s about the people who are playing it and the place where it’s being played. In that regard, Chess Ultra does an excellent job of providing a sense of place when you’re playing. Whether it’s against the CPU, another person in the same room, or online, the game’s settings do a great job of making you feel like you’ve stepped into another place. Whether it’s a lounge, a public area, or the foreboding mountaintop of Gomorrah, each area in Chess Ultra has its own unique feel and atmosphere. Whether it’s the haunting music and rushing wind of the mountaintop map, or the gorgeous opera that plays in another map, the whole experience lends a level of emotion and atmosphere to the proceedings that you couldn’t achieve in your living room. Beyond this, the feeling of each match is exhilarating, even if you’re not a big fan of chess itself. For example, I played a few matches against my girlfriend Christina and, while she won, Chess Ultra still provided that feeling of intensity as the match came to close. It’s that feeling of uncertainty, of whether you’re going to win or lose. You never know what the next move will bring. That intensity is the same feeling that just about every strategy video game has strived to achieved. Chess itself is the origin of all strategy in gaming, and in this regard, Chess Ultra captures that feel of being moments away from victory or defeat, the thrill of battle, distilled to its purest form. Chess Ultra focuses on making itself accessible to both chess enthusiasts, and casual players alike. The game has Grandmaster approved AI levels that range from decent chess players, to worth adversaries, to opponents that will make your head spin and cause you to question your life choices. In other words, any level of difficulty you want is available to you. You can also play locally, or online with other players. A wide variety of settings allow you to customize the experience with game timers, locations, piece sets, and color choices. For beginners, an option to see potential moves when you select a piece is on by default. This helped me out as I had to recall the movesets for all the different pieces. Perhaps the most interesting inclusion here is a VR mode that allows you to use PlayStation VR and go up against the Grim Reaper in a battle of wits and strategy. While in VR, you sit across from death himself on the blackened mountaintop of Gomorrah. During your match, you can look up and stare into the flaming eyes of death, and during your turn he was clack his bony fingers together or tap them on the board. I especially enjoyed when I made a good move and his eye erupted in flames as he clenched his fists in frustration. Using the PlayStation Move, you can actually pick up and move your pieces in VR. This adds an excellent sense of immersion and makes you feel like you’re really playing a game of chess. The only downside to this mode would have to be the graphics. They’re not terrible, but I know PSVR could do better. The main issue comes from the actual chess pieces, which are a little blurry and hard to recognize from a distance in VR. This is in stark contrast to the crisp and clean graphics of the main gameplay. Despite this hindrance, I still really liked playing chess in VR, and the rest of the game includes a variety of challenges and training tutorials to help true chess players sharpen their skills. As a chess package, it’s an excellent representation of the game as whole. I would have loved some more locations and sets to work with, but the VR inclusion is a nice touch that really helps it stand out. While the VR mode in the game can be a little blurry, the overall presentation of Chess Ultra is positively exquisite. The game’s pieces and boards are lovingly crafted and presented in stunning detail. This kind of love goes into the environments as well. There’s a lot of little details in the area around the board that make the areas feel alive and tell little stories of their own, such as the ticket and camera beside the board in one of the areas. I also really liked how the music changed depending on your area. Gomorrah has a chilling soundtrack, while the public Italian location has some soothing opera playing in the background. The wide range of music in the game’s soundtrack adds yet another layer of polish to the presentation. Overall, Chess Ultra succeeds by perfectly simulating the game of chess, while also making you feel like you’re playing in exciting and exotic locations. Combine this with a really cool VR mode, and you have the best chess game you can currently buy on the PS4. 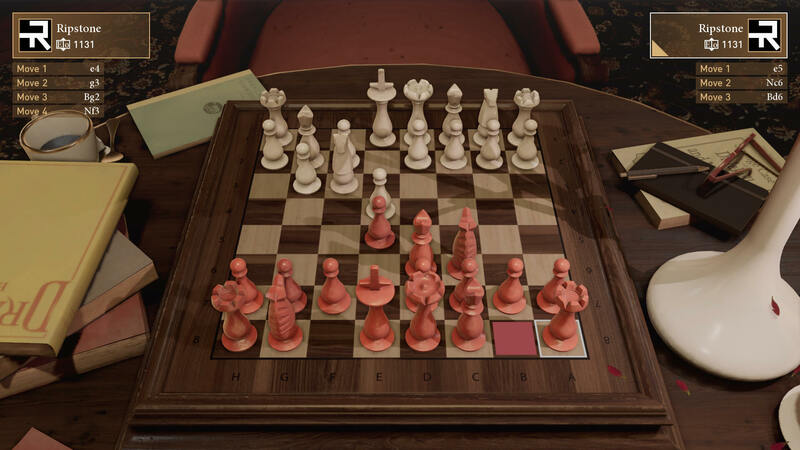 While I wish the graphics in the VR mode were a little sharper, and some additional piece sets and locations would have been a nice touch, what’s here is absolutely worth your time and money if you’re a chess fan. Your Queen moves to H4 to attack your wallet and...checkmate!